Saint Benedict, [the Father of Western Monasticism (480-543)] blessed by grace as his prophetic name seemed to foretell, was born of a noble Italian family in Umbria, in the year 480. As a boy he showed great inclination for virtue, and maturity in his actions. 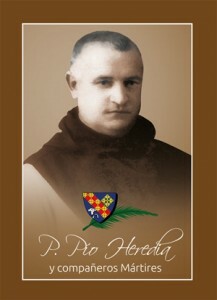 He was sent to Rome at the age of seven, to be placed in the public schools. At the age of fourteen, alarmed by the licentiousness of the Roman youth, he fled to the desert mountains of Subiaco, forty miles from Rome, and was directed by the Holy Spirit into a deep, craggy, and almost inaccessible cave, since known as the Holy Grotto. He lived there for three years, unknown to anyone save a holy monk named Romanus, who clothed him with the monastic habit and brought him food. He was eventually discovered, when, one Easter day, God advised a priest who lived about four miles from there, to take food to His servant, who was starving. The priest searched in the hills and finally found the solitary, and they took their meal together. Some shepherds also knew of his retreat, and soon the fame of this hermit’s sanctity began to spread. The demon persecuted him, but to no avail; when a temptation of the flesh assailed him, he rolled in a clump of thorns and nettles, and came out of it covered with blood but sound in spirit. Disciples came to him, and under his direction, numerous monasteries were founded. The rigor of the rule he drew up, however, brought upon him the hatred of some of the monks, and one of them mixed poison with the Abbot’s drink. When the Saint made the sign of the cross on the poisoned bowl, it broke and fell in pieces to the ground. Saint Benedict resurrected a boy whose father pleaded for that miracle, saying Give me back my son! He replied, Such miracles are not for us to work, but for the blessed apostles! Why will you lay upon me a burden which my weakness cannot bear? But finally, moved by compassion, he prostrated himself upon the body of the child, and prayed: Behold not, O Lord, my sins, but the faith of this man, and restore the soul which Thou hast taken away! And the child rose up, and walked to the waiting arms of his father. When a monk lost the iron head of his axe in a river, the Abbot told him to throw the handle in after it, and it rose from the river bed to resume its former place. 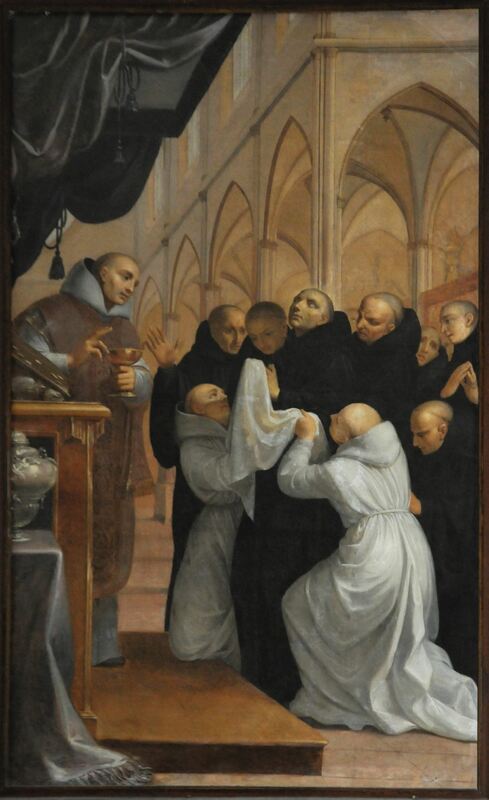 Six days before his death, Saint Benedict ordered his grave to be prepared, then fell ill of a fever. On the sixth day he asked to be carried to the chapel, and, having received the sacred Body and Blood of Christ, with hands uplifted and leaning on one of his disciples, he calmly expired in prayer, on the 21st of March, 543. Reflection. The Saints never feared to undertake any work for God, however arduous, because distrusting self they relied for assistance and support wholly upon prayer. The Church prays at Mass today: O God, who have given us in Saint Frances of Rome a singular model of both married and monastic life, grant us perseverance in your service, that in every circumstance of life we may see and follow you. Today is the feast of a great Benedictine monk, bishop and cardinal of the Church. 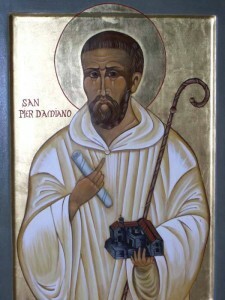 The Mass prayer quotes the Rule of Benedict when it says “putting nothing before Christ” connecting the ministry of Peter with his “ardent in the service of your Church, we may be led to the joys of eternal light.” Peter was a great reformer of the monastic life and the Church. Given the state of the Church today in some places, we need another Peter Damian. You asked me to write you some words of consolation, my brother. Embittered by so many tribulations, you are seeking some comfort for your soul. You asked me to offer you some soothing suggestions. But there is no need for me to write. Consolation is already within your reach, if your good sense has not been dulled. My son, come to the service of God. Stand in justice and fear. Prepare your soul; it is about to be tested. These words of Scripture show that you are a son of God and, as such, should take possession of your inheritance. What could be clearer than this exhortation? Where there is justice as well as fear, adversity will surely test the spirit. But it is not the torment of a slave. Rather it is the discipline of a child by its parent. Even in the midst of his many sufferings, the holy man Job could say: Whip me, crush me, cut me in slices! And he would always add: This at least would bring me relief, yet my persecutor does not spare me. But for God’s chosen ones there is great comfort; the torment lasts but a short time. Then God bends down, cradles the fallen figure, whispers words of consolation. With hope in his heart, man picks himself up and walks again toward the glory of happiness in heaven. Craftsmen exemplify this same practice. By hammering gold, the smith beats out the dross. The sculptor files metal to reveal a shining vein underneath. The potter’s furnace puts vessels to the test. And the fire of suffering tests the mettle of just men. The apostle James echoes this thought: Think it a great joy, dear brothers and sisters, when you stumble onto the many kinds of trials and tribulations. When men suffer pain for the evil they have perpetrated in life, they should take some reassurance. They also know that for their good deeds undying rewards await them in the life to come. Therefore, my brother, scorned as you are by men, lashed as it were by God, do not despair. Do not be depressed. Do not let your weakness make you impatient, Instead, let the serenity of your spirit shine through your face. Let the joy of your mind burst forth. Let words of thanks break from your lips. The way that God deals with men can only be praised. He lashes them in this life to shield them from the eternal lash in the next. He pins people down now; at a later time he will raise them up. He cuts them before healing; he throws them down to raise them anew. The Scriptures reassure us: let your understanding strengthen your patience. In serenity look forward to the joy that follows sadness. Hope leads you to that joy and love enkindles your zeal. The well-prepared mind forgets the suffering inflicted from without and glides eagerly to what it has contemplated within itself. 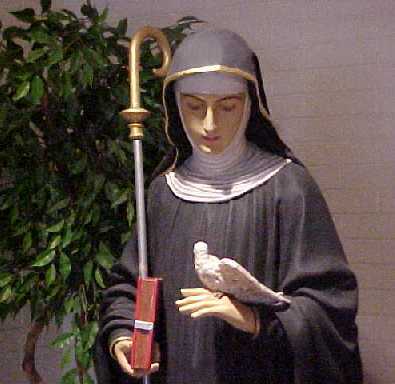 Today’s liturgical feast of Saint Scholastica (480-543) is indeed a special one for all of us who follow and live the Benedictine charism. 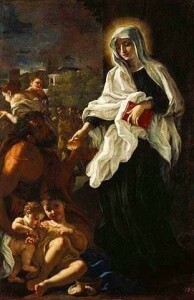 Scholastica, the twin sister of Benedict was born in Norica (Italy) and some of her bones are entombed with her brother’s at the Archabbey of Montecassino. What we know of Schoalstica comes from a brief entry in a greater work by Pope Saint Gregory the Great, The Dialogues. Sister Catherine gives a keen reflection on the place of Saint Scholastica for us today. Our thoughts turn to the various Benedictine monasteries in the USA and abroad, especially St Scholastica Priory (Petersham), for the Saint’s intercession. Saint Scholastica is the patron saint for nuns, but she is asked to stop lightening, rain, and storms. Perhaps she has some influence over stopping snow (for the time being)? No flood can quench nor waters bring it harm. Who served in love and followed in your way. You taught while Mary sat and heard your word. She listened well and lived out what she heard. That perfect joy the Holy Rule proclaims. With hearts of praise, let us your grace acclaim. O Triune God, our thankful hymns we give!